I am just learning about him!!! Isn’t it amazing how doors open when they do. I’ve got my garden boxes on order and have got some urban farmers ready to tutor me with an edible garden. In fact I’m going to try to grow some garlic – and now is the time to plant the bulbs. I loved that part in the quote too! A real ‘stop you in your tracks’ kind of comment. I forgot to put in bold, but will do so now, thanks for the reminder! 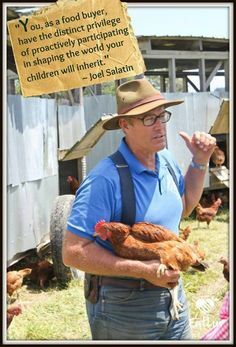 My daughter read Salatin’s book last year and loved it. She keeps telling me to read it. The section in The Omnivore’s Dilemma on his farm was my favorite part of the book. He’s so witty and brilliant. Good luck with your garden. How exciting!